The White House is refusing to comply with a bipartisan congressional records request into its spending on travel and the use of government aircraft by political appointees, according to a committee making the request. Reps. Trey Gowdy, R-S.C., and Elijah Cummings, D-Md., the respective chairman and ranking member of the House Oversight and Government Reform Committee, reiterated their desire for the information in a letter on Thursday to White House Chief of Staff John Kelly, saying the administration’s excuse for non-compliance was unacceptable. The committee leaders initially requested the information on the use of government-owned aircraft for personal travel or non-commercial private aircraft for official travel in September, but the White House said it would be unable to provide the information. 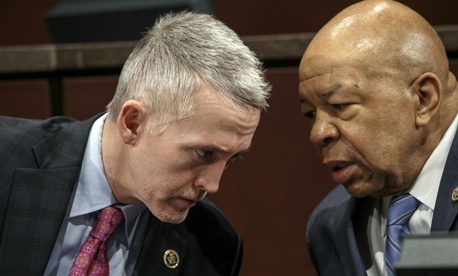 Gowdy and Cummings opened their investigation following reports of abuse of taxpayer-funded private and government aircraft travel by Trump administration officials, which eventually led to the resignation of then-Health and Human Services Secretary Tom Price. The committee sent letters to Kelly as well as 24 agency leaders across government, but followed up specifically with the White House. Kelly was unable to accommodate the committee’s request, White House Director of Legislative Affairs Marc Short told the lawmakers, saying not all the components in the Executive Office of the President fell under the chief of staff’s purview. That explanation was “at odds with” the White House website, Gowdy and Cummings posited, which states that all of EOP is overseen by the chief of staff. Either way, they said, Kelly should give the committee the information it is seeking. “Assuming arguendo the information on your website is incorrect—EOP components do not fall under your authority—I trust you can nevertheless facilitate their response to the committee's request,” they wrote. The lawmakers have struggled to get agencies to comply with their request for travel spending information. In October, they sent letters to the departments of Justice and Agriculture, threatening to subpoena the information due to non-compliance. Thirteen agencies provided only part of the information the committee sought, prompting a separate follow up letter to each of their leaders. The committee is now also requesting information on non-commercial or government aircraft travel for non-career, unelected officials from Jan. 1, 2016, through Jan. 19, 2017 to determine “whether new policies or regulations need to be enacted or perhaps to even change the nature of appropriations” awarded to the agencies. The Trump administration has already changed its travel policies for political appointees in the wake of the variety of scandals that engulfed its leaders, with Office of Management and Budget Director Mick Mulvaney informing agencies all chartered or government aircraft travel must be approved by the White House. Several inspectors general are currently conducting reviews into alleged travel misconduct by Trump administration officials.